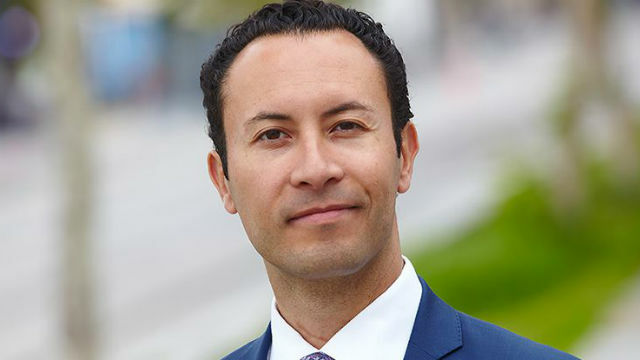 Port Commissioner Rafael Castellanos announced Thursday his candidacy for San Diego County supervisor in the March 2020 primary. Castellanos, an attorney who is chair of of the Port of San Diego board, is seeking the District 1 seat held by termed-out supervisor Greg Cox. He will face former City Councilman David Alvarez, who announced his candidacy a year ago. “I’m running for county supervisor to build a brighter economic future for South Bay families and ensure all our communities are treated with the dignity and respect they deserve,” said Castellanos, a Democrat who ran unsuccessfully for City Attorney in 2016. “I’ll take on the politics as usual downtown, which has shortchanged South Bay for decades, and stand up against the divisive politics of Trump, which threaten our basic values,” he added. The district includes includes parts of San Diego, Coronado, Chula Vista, National City and Imperial Beach and has a population of more than 600,000. Castellanos grew up in rural Nevada to immigrant parents and was the first in his family to graduate college. He earned his law degree from the University of Chicago, where he was a student of then-professor Barack Obama. He lives in Otay Mesa with his fiancée Angie Lake and their two children.